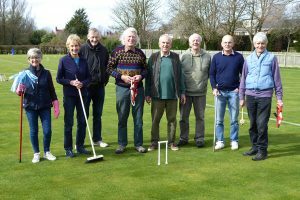 After a successful day on Thursday, 21 March, setting out the lawns for the new season, the mop and mallet mob returned on Saturday, 23 March, and enjoyed some spring sunshine to finish the task and to spring clean the clubhouse. Thanks to our volunteers, all the lawns are now ready for play and a clean and tidy clubhouse is now open for business. We wish all our members, old and new, an enjoyable and successful season.